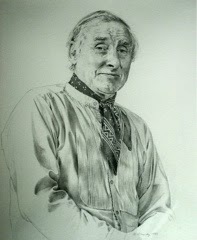 I watched a documentary yesterday evening about the life of the comedian Spike Milligan. It gave me an idea. 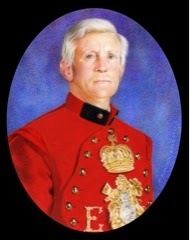 Several years ago I painted a large portrait of Spike and thought it might be of interest to the many artists who read my blog to regularly post portraits of the more interesting or famous people I've painted, together with short anecdotes. In the 50's when we all were fans of the Goon Show I went to a live Goon Show broadcast in London, never imagining that one day I'd actually meet Spike Milligan. 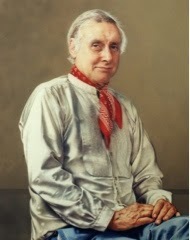 However in 1988 he agreed to sit for a portrait. The day came and I travelled to his home in London. Arriving about twenty minutes early I rang the bell. When he opened the door, instead of the fun-filled goon I expected to meet he coldly said "It's just as rude to be early as it is to be late. Sit there!" I felt quite demoralised. But exactly twenty minutes later he came down the stairs with a beaming smile. A real chameleon of a man. That day passed memorably as I sketched and photographed him. At one stage he casually announced that he'd just sold his house to a Japanese family. "They don't know it yet, but on the anniversary of the Japanese attack on Pearl Harbour this coming December, the house will blow up!" Everywhere in the house were large placards written in his black, spidery lettering reading 'This is a no smoking zone'. What a fascinating, zany and talented man he was. Next blog I'll describe some of my encounters with the Sultan of Johor in Malaysia. 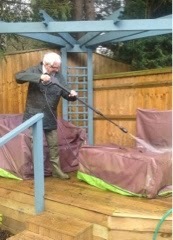 Last weekend I donned waders and waterproofs to prepare for power washing my young friend's sun deck and to clean up some of the mess left by the birds on the covers of the garden furniture. (The last time I power washed her patio I became covered in dirt and was soaked through. Now learned my lesson). A marauding herd of neighbouring squirrels seemed to have eaten all the tulip and crocus bulbs we so carefully planted at the beginning of the year. At least the daffodils are unscathed - apparently they are poisonous. Each year I send to four miniature societies for exhibition at their annual shows. They are The Royal Society of Miniature Painters, The Hilliard Society, the Society of Limners and the Miniature Art Society of Florida in the USA. 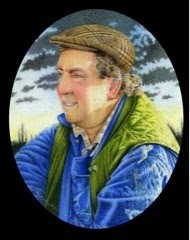 Usually I submit a combination of commissioned work (borrowed back from my clients) and new work. This year I decided to prepare all seven miniatures for the RMS as early as possible. Here are three of them. 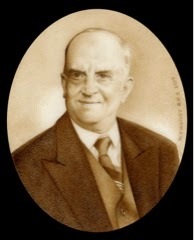 Farmer George, Tony Hobbs - Waterman to the Queen, and a sepia painting of my grandad. 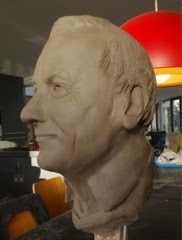 Still on artistic subjects the sculpture I'm working on of my cousin Paul is nearly reading for the bronze stage. Still a little way to go with the clay to get more of a likeness. 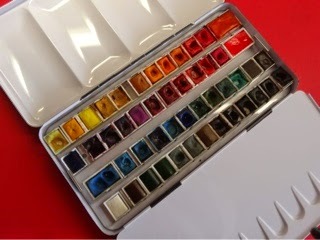 My watercolour paint boxes have become so encrusted and dirty over the years that I decided to find out whether It was possible to buy a new, big box. 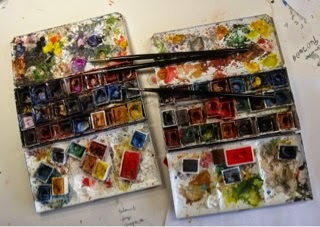 Cornelissen - the best art suppliers in England - helped out. Spent a lot of today cleaning all the pans and fixing them much more logically in the new box. These were the old boxes.